This post is about Munroe Island Kerala and my wonderful homestay experience with Vijeesh and his family that showed me the most beautiful place to see Kerala’s backwaters. Travelling always gives you welcoming surprises, sometimes in the most unexpected remote places in this world. While looking for ways to explore the backwaters of Kerala I stumbled upon a place called Munroturuttu, or in English: “Munroe Island”. Most people explore the backwaters from Allepey, Kollam or Cochin. However, after reading all the positive reviews about Vijeesh’s homestay I decided to go to Munroe Island Kerala. It turned out to be one of the highlights of my South India trip. Even though most people get to Munroe Island by taxi from Kollam I took the train. Not something a lot of people do and I was the only foreigner in the ladies wagon. There was a lot of staring and giggling, but the woman were all friendly and told me when I was at the right station. It’s these moments that I cherish most in India. Some people get annoyed by all the attention or misunderstand people’s intentions. In the end most people are just curious. With all signs in Malayalam, Kerala’s own language that has its own script, I would not have known were to get out. Munroturuttu train station was nothing more than a single platform and a tea shop surrounded by palm trees. The tea shop owner already seemed to know where I was going. I received a cup of tea and he gestured for me to sit down. Another thing that I love about India is that once people adopt you they go out of their way to make sure you are fine. He made a phone call to my homestay and in half an hour Vijeesh turned up on a motorbike. While driving through Munroe island I could only be amazed with the scenery. This truly was paradise on earth. After lunch Vijeesh gave me a small walking tour through the island explaining me everything about the biodiversity of the area. It is here that I developed a love for birds and birdwatching. We saw plenty of playful kingfishers, impressive Brahminy kites and elegant egrets that Vijeesh pointed out for me. The island is also rich in spice plantations, coconut farms and rubber manufacturers. We ended our walk with a refreshing dip in the local river wattching the clouds turn yellow, red and pink. By 7 PM it was pitch dark and hundreds of stars appeared in the sky. 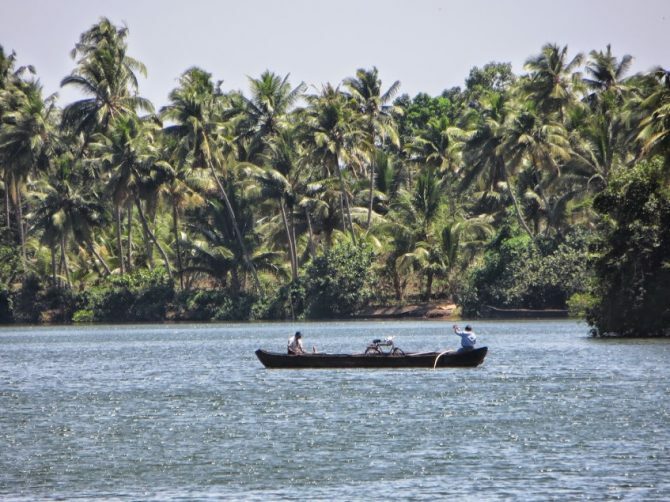 The next day Vijeesh showed me Kerala’s backwaters. Most people visit the more famous Allepey, but I am so glad I choose to visit a different place that is less known. The large and busy waterways in Allepey were nothing compared to the beauty of the narrow and quiet palm fringed canals of Munroe Island. With his small canoe Vijeesh could navigate the most narrow canals. It was such a peaceful and serene experience and its beauty was astounding. It turned out I planned my trip to Munroe Island exactly at the time the local temple had its festival. Together with Vijeesh I watched the temple celebrations with the elephants as the main stars of the show. The real festival was only to start during the night at 3 am when the elephants were going through town in a procession with dance and music. Families had lit their homes with candles waiting for the elephants to pass to give them flowers and bananas. At last, everyone went to the temple for the final rituals with gigantic fireworks. It was a great goodbye to a wonderful place that was hard to leave the next morning. Not only because of my lack of sleep. I am not sure if there are any other places to stay at Munroe Island, but I can recommend with all my heart Vijeesh Homestay. He was also mentioned by the Guardian as one of India’s local heroes. If you want to explore more of Kerala backwaters I can recommend my post on the best backwater destinations in Kerala. The nearest city is Kollam from where you can either take a taxi or a train. The journey takes less than 20 minutes. From Kollam there are 4 trains in the morning (07:45 – 08:35 – 08:50 – 11:10) and 3 trains in the evening (17:10 – 18:43 – 19:05). You can also go directly to Allepey for more backwater experiences. There are two trains a day from Munroe island taking less than 2 hours. One in the morning at 09:09 and one in the evening at 18:55. From Allepey to Munrotoruttu there are trains at 13:40 and 17:05. Unfortunately the future of Munroe Island in Kerala is very uncertain and it is better to visit sooner rather than later. Experts still disagree whether it’s the effects of the tsunami in 2004 or a dam nearby, but the island is sinking. In 2018 heavy monsoon rains caused flooding throughout Kerala and Munroe Island was affected as well. Unfortunately floods are becoming a regular problem. With climate change it is unlikely that a sustainable solution can be found. That pic of the river with the palm trees…no words…other than OUTSTANDING!! That picture has to be one of the best pictures that I have ever seen. It is so beautiful that it looks like a painting done by a great artist. I just kept staring at it! It should be in National Geographic…seriously. Ugh, I need to prioritize my bucket list with climate change into account. Thanks for sharing this beautiful island!